Occupation: Formerly the lead singer in the band “Acrid Rain Pours”. Currently the Commander of the 5th Regiment and UNION. -“Gauntlets” on her wrists and stretching up her lower arm to form a protective resin that’s the same make up as the tail. They can be used to deflect anything sharp or even bullets but they’re so small that the protection is limited. Likes: Nightcore, people (but that conflicts with her trust issues), guitars, helping others, caramel latte coolers, the colour grey, being loud, singing. 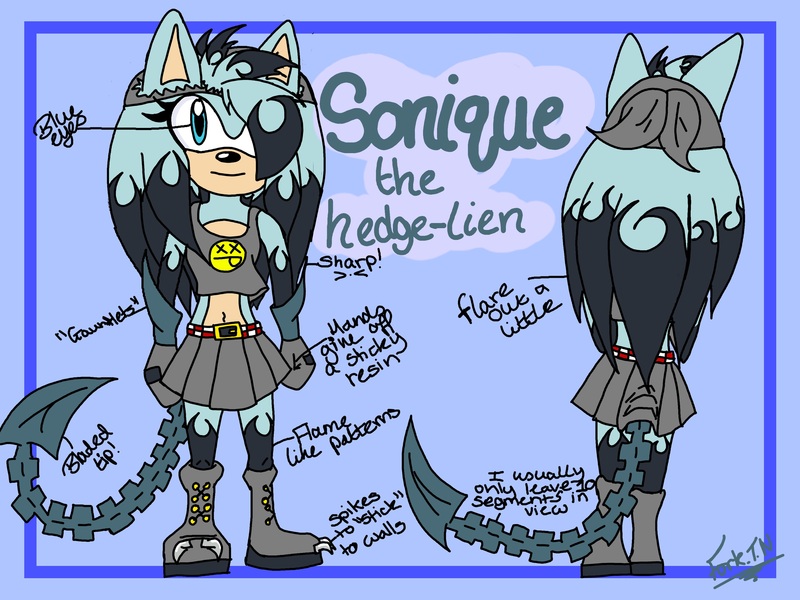 Sonique was a normal hedgehog living in the city of Braxus (this is a city in a different dimension to Sonic and his pals). She had friends, a career in singing and a boyfriend named Thore. She had it all until one day her life change forever. Taken straight from the streets she'd called home for so long she ended up in a facility passing as an Academy owned by the notorious Alun Faust. A human hell bent on creating an army of super soldiers. Sonique was the first animal type to be taken and was the most successful of the soldiers created. They tortured her with in-humane experiments; even attaching a facehugger (yes, this universe has the species of alien from the franchise Alien in it) and later removing the chest burster only to discover that her very DNA had been slightly altered by the incubation of the alien in her body. And there started the gene splicing with the very same alien they removed from her chest cavity which became a good friend of hers and they supported each other through the gruelling tests and went on to share quarters for monitoring purposes. She soon sprouted a black segmented tail with a blade at the very end, sharp and at the ready, her arms grew gauntlet like guards, tapered off to be sharp and used to impale someones throat if the arm is angled right, they were also impenetrable, but remain the only form of shield to her person which isn't much due to the small size of them. Her strength doubled and her senses grew sharper and sharpened further when she closed her eyes. So potentially she could fight blind. Her powers which the Academy referred to as "DM" (shortened to symbolise Dark Matter which is what they are) were utilised as a shield to protect her person and surround a person or object to throw it away from herself to recuperate. Her powers drained her to the point where she'd pass out and she'd enter a "crazed" faze in order to keep herself alive which consisted of her losing control and everything being crushed around her in a blue haze of huge proportions. Therefore they scrapped the DM's and implanted dampeners into her upper arms which shocked her if she ever tried to use them. She eventually learnt not too and was conditioned to never use them. She was put through more gruelling tests until finally the Academy was shut down by The 4th Regiment; a group organization created by the Government of Braxus to keep the peace and take down any militant service that stood against them. They freed Sonique and offered her asylum along with her very own Alien companion known to the scientists as "6", but Sonique affectionately called him Sparx due to his explosive personality. She was going to reunite with her old friends and notably Thore, but found out she'd been gone for 4 years. She was shocked at the development, but not shocked that Thore had managed to find someone else and had a little boy 'hog with his current fiancée. It broke her heart but she was glad that he moved on and proceeded to let him go to pursue his own life with the family he'd created. It eventually stopped hurting and brought her great joy to imagine he was happy. She was eventually pursued by Faust once more, The 4th Regiment the only thing in his way as she made a hasty escape to another dimension due to a special device given to her by the Regiment's leader: Trey the hedgehog. She jumped and landed in Sonic the hedgehog's dimension where she met Shadow the hedgehog and Rouge the bat. The device in which she used to jump dimensions was broken, the dial having been smashed up so it couldn’t be used. She ended up meeting Sonic and the gang not long later and developed a relationship with "the ultimate lifeform", first friend then something more. GUN eventually caught wind of her mutation and her friend Sparx which led to an interrogation from Rouge and Sonique told her everything that they'd done to her. About her skipping dimensions, her mutation and Faust who was after her. She made new friends in Sonic and his friends and Tails fixed the dimension hopper while making a duplicate for himself to keep in case they needed to skip a dimension or two in the future and all was well. For all of five minutes anyway. Faust managed to find her, dimension hopping with his super soldier army having defeated the 4th Regiment in Braxus only to move to Station Square. She thought fast and enlisted the help of the Sonic Team to take him down, but it proved difficult with the sheer force in which he utilised his army and so she decided to sacrifice herself in order to get rid of Faust once and for all. Que the echoed: "Nooooooooooo!" From Faust and they landed somewhere that looked purely medieval. A castle in the distance and a young man with white and black fur/hair stood staring at her with wide green eyes. She stood there dumbfounded while Faust lifted a gun which he'd been holding onto (don't judge me, this is supposed to just be a back story damnit... Just a brief of what happened haha), but the young man threw a dagger at the guys hand to knock it out of his hand. Faust ran off into the emerald forest and Sonique continued to watch the man before her. His piercing eyes met hers and she nodded to which he grinned with a nod back. Que Sparx who was thrown a little away from Sonique in the dimension hopping fray and the guy jumped in front of Sonique to protect her from him to which she’d laughed and explained what she could. Eventually, they moved to the castle where she found out his name: Artemis Archais Tremelyan and he was the son of the Queen Tabitha Tremelyan. The Queen divulged that they had problems of their own and an enemy to fight themselves but issued a few assassins to take out Faust. She and Artemis became quite close and became lovers soon enough. She met his sister, a sweet girl by the name of Tiana Tremelyan who had the ability to control the element of lightning. She was one in a long line of Tremelyans who had the ability, her late father included. The biggest scandal for being the first woman to have the ability granted from the family tree. A few years passed with only the war with Constantine being the only problem and Sonique married Artemis at long last and became a Princess and Commander of the Royal guard alongside her Husband who was Captain of the Royal guard. Her luck had finally run out when Faust, with his superior technological mind created a super soldier that could bend the very earth beneath you. The soldier created a chasm in which he threw Faust and his plan down and crushed his body signalling the end of Fausts very existence but the start of a whole new war. Sonique was ordered by the Queen to dimension hop again but to take Tiana and Artemis with her. Sonique was obviously reluctant but the Queen begged her to which Sonique quickly did as she was told, dragging the siblings with her to her own dimension which was in disarray due to the 4th Regiment no longer existing. She and Artemis fought a lot after that but their love stayed strong and together they formed the 5th Regiment. An underground operation run by both husband and wife to protect the innocent and keep Tiana safe so that they may live in a world without pain. She later learned that the acid in her blood was still mutating which meant that the dampeners that inhabited her body must have been destroyed because before long she was making shapes and barriers once again to protect her new family. Her very essence was still mutating to accommodate her Alien DNA, which made her re think her very existence for a while as she battled the urge to slaughter those around her. She eventually found a solution to the problem in Sparx who created a preliminary bond with her, creating an unbreakable link, bar death of course. The link stabilised her to the point that she became a very capable Captain to the Regiment. Her alien companion continued to follow her and became a welcomed asset to the 5th Regiment as an assassin/recon soldier but never left without his trusted Captain Sonique at his side. From then on they all worked together to build a new world of peace, and in turn formed another company: UNION. -Lives in a parallel dimension to the Sonic Universe where the Alien from “Alien” exists. -Sonique LOVES gaming raps. To name a few: Borderlands 2 rap, Deadpool rap and Master Chief vs Locke rap. -Sonique’s most sung song was “Cut” by Plumb due to her experiences with self harm after her Grandfather passed away and it became a quick favourite after she was taken while she sat in her prison with Sparx. Thore was actually Sonique’s first love; they’d been together since they were in Highschool at the tender age of 13 until it eventually came to an end at the age of 20 to no fault of either of them. Thore was a happy guy constantly winking to try and make Sonique blush to which she’d just fold her arms and shake her head with a raised brow and a grin. They also started their band at 16; “Acrid Rain Pours” wasn’t very well known but it was a hit with the families of the band members. They played at family functions all the time whether it be a wedding or a birthday, they were there. She even had Thore move in with her at the age of 17 and they lived together for 3 years happily before she was taken. A mad man by nature; his ploy to create super soldiers prompted him to kidnap people from the streets and have others sign contracts that bound them to the Academy under false pretenses. The times when Sonique would see him would be during tests and that was when she’d hear him yelling curses at her over the intercom when she refused to fight the current test subject before her. He’d also be on the other end of the shock collar which hung heavy around her neck. He was cruel and would pit her against people who had clearly been driven mad by the tests they carried out giving her no choice but to defend herself against those people. The day he died was the day she felt truly free. Sparx had been there from day one when they’d run those tests and pit them against people. He’d be there at the crux of it, pulling on the slight mental link that they had from being Host and “child” to help her stay sane. He was also there when she lost control and managed to talk her down in his special way. He’d hug her and make her feel safe and accepted even if she was felt like an abomination. Their current link is going strong and is literally unbreakable unless caused by death. Shadow was a friend/boyfriend of Sonique’s that seemed fleeting because it was. They were close and shared a few unspoken kisses together in the dark of night, together for only a few weeks and then torn from each other the next second. Shadow still lives amongst Sonic and friends and accepts that Sonique needed to do as she did and she accepted that they weren’t meant to be together, not really. A fleeting romance. Her unknown saviour and protector while in the Medieval Universe of Tomlinhime. A Soldier and secret Assassin born and raised in the Tomehime Palace who was prompted to attend to Faust with the help of other Assassins and Sonique herself as the Queen couldn’t spare too many people. They started off as good friends and travelled the lands together in search of her tormentor Faust, but as they travelled they became closer and set their for then camp alight with gossip which was sent back to the Queen. They finally shared their first kiss and sparks flew from then on; they later went on to share a tent and even had Sparx checking in on them to make sure there was no “funny business”. Sonique and he went to become Husband and Wife a few years later when they’d figured that Faust was long gone and became Prince and Princess of Tomehime and leading the Royal guard co-operatively. And after Fausts demise, they travelled to Sonique’s original Universe. They fought due to the circumstances; but continued to be together through it all and succeeded in creating a company known as The 5th Regiment and then later on UNION. She and Sonique became the best of friends quickly due to the two’s powers and bonded over the knowledge that they could do similar things. Being the sister to Artemis and sole heir of the Tremelyan’s lightning ability she was Artemis and Sonique’s main concern at the beginning but with a little training from Sonique and Artemis she became quite the little fighter. She and Sonique remained friends and argued with each other on occasion on who would tell Artemis to take a break, and it usually ended up being Sonique.